1) Find us online car wreckers or call us on 0800 707 099 and submit basic information about your car such as make, model, year, mileage, body condition, & engine condition. 2) Our professional team will give you an offer based on year, make, model, mileage & condition. 3) Once you accept the offer, we will schedule a time to come pick up your car, truck, or van; at which time you will receive your cash on the spot. It’s exactly what it says – get Cash Now, in your hand. Whatever the age, whatever the mileage, whatever the condition – Cash for car are interested in buying your car, van, 4WD, or truck. We buy all broken and junk cars in Auckland and beyond Greater Auckland region. 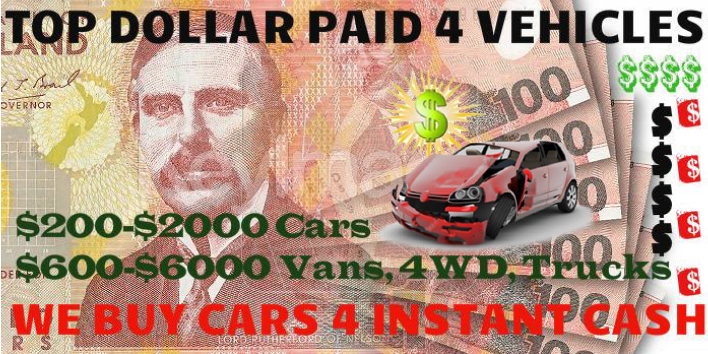 Cash for Van also pay cash for all commercial Vehicles such as Van, Ute, 4wd and trucks not only cars. Our prices are guaranteed over the phone unlike our competitors. We provide a cash for cars removal service in Auckland and surrounding suburbs, with over 15 years of experience in Car Removal. Find your local cash for cars branch: cash for cars North shore, cash for cars Hamilton, cash for cars Wellington, cash for cars Christchurch, cash for cars Ashburton. We do operate in Australia as well cash for cars Brisbane, cash for cars Perth, cash for cars Sydney.